A lot of my designs incorporate wood in some manner. 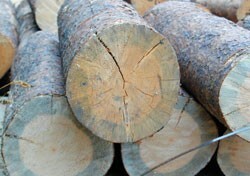 In keeping with reuse and minimizing our impact, I am now utilizing blue stain pine, salvaged from beetle kill trees. What is blue stain pine? Blue stain pine is a result of the bark pine beetle’s attack on pine trees – the blue stain (not actually a wood stain) is a fungi that blocks the trees resin response, which is the tree’s natural defense (hence why trees under stress, and therefore are not producing enough resin, are often the first attacked in an outbreak). The mountain pine beetle has been causing havoc among western forests, including Colorado. Learn more about the mountain pine beetle here. Keep an eye out for our first creation using blue stain pine. ← O.A.Q. #1 Do you build things out of snowboards?